Walt Disney made his mark on comedy films in 1959 with The Shaggy Dog, so its surprising that it took 2 years before this formula was repeated with The Absent-Minded Professor. Walt was reportedly drawn to live action material that could have been done in animation. And this film certainly boasts enough special effects to have warranted being done in that medium. To add to the similarities between this film and The Shaggy Dog, they both share the same producer (Bill Walsh) two lead stars (Fred MacMurray and Tommy Kirk). Also Forrest Lewis, who played Officer Kelly in The Shaggy Dog reprises the same role in this film. Both films were shot in black & white to conceal the tricks used in many of the special effects. Ed Wynn has a cameo appearance and his son, Keenan Wynn, makes his Disney debut as Alonzo Hawk, the film's villain. And Nancy Olson plays opposite Fred MacMurray after an Oscar nominated performance in Sunset Boulevard and making her Disney debut in Pollyanna. One of Walt's go-to directors, Robert Stevenson, took charge of the film having already established himself at the studio with Old Yeller, Darby O'Gill and the Little People and episodes of Zorro. The flying car effects were achieved through wire tricks, scale models and matte paintings. Most of the film was shot on the Disney Studio lot. A keen eye will recognize most of the houses on residential films from The Shaggy Dog and the studio's office and animation buildings served as the exterior for Medfield College. Professor Ned Brainard misses his own wedding for the third time when he accidentally invents a substance called flubber that never loses energy. Not only does he get in hot water with his fiance Betsy, but also with Medfield University after he fails their star basketball player and son of Alonzo Hawk, the school's biggest donor. After testing out his invention on his car, which gives it the ability to fly, he irons flubber onto the basketball teams' shoes, which gives each player the ability to bounce higher than the opposing team and win the game. When Alonzo Hawk witnesses Professor Brainard in his flying car, he approaches him with a business proposition to expand Medfield College for the sale of Flubber, but Hawk wants to use it to blackmail the government. Professor Brainard declines Hawk's offer, so he steals the flying car. When Betsy forgives him for standing her up at the alter, she helps him steal back the car. After being chased and narrowly escaping, Brainard and Betsy take the flying car to Washington, D.C. After turning over the invention of Flubber to the government, they finally get married and fly off into the night. When The Absent-Minded Professor was released on March 16, 1961, critics raved about its light hearted tone and humor and audiences made it a huge success. It was rereleased twice in 1967 and 1974. It made its VHS debut in 1981 and a controversial colorized version was released in 1986. It was nominated for three Academy Awards for special effects, art direction and cinematography. Fred MacMurray was also nominated for a Golden Globe for best actor in a musical/comedy. 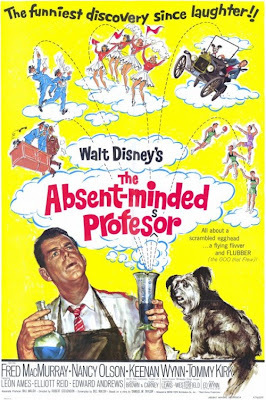 Thanks to a clever plot, great performances and dazzling special effects, The Absent-Minded Professor is one of the best Disney comedies ever made. A large part of its success seems to be the casting choices. In less capable hands than Fred MacMurray, Ned Brainard could have come off as an unlikable doofus. He breaths so much charm and life into the character and the rest of the cast provide fully realized and developed performances. This film is notable for being the film debut of songwriting duo Richard and Robert Sherman (aka: The Sherman Brothers). They would go on to write some of the most memorable Disney songs, including the entire soundtrack for Mary Poppins and the theme park song "It's a Small World." The had previously achieved success writing songs for Annette Funicello, which were released on Disney's record label. A sequel was made in 1963 called Son of Flubber. The Absent-Minded Professor has been remade twice, as a TV movie in 1988 and then a theatrical remake in 1997 called Flubber starring Robin Williams. And while Medfield College originated in this film, it would become the setting for many other Disney comedies. The Absent-Minded Professor is currently available on DVD. Sadly the DVD contains no bonus features, which is perplexing given how beloved and well known the film is. It is presented in a widescreen aspect ratio of 1.66:1, but this is actually framed incorrectly. According to guides sent to theater owners with the film in 1961, it was meant to be framed at 1.75:1, meaning you are seeing more image on the top and bottom than the filmmakers intended. However, this widescreen release is much closer than a fullscreen release would have been and it's better than nothing. It is also available as a combo pack paired with the sequel, Son of Flubber. The film is also available on iTunes where it is available in widescreen HD. The absent minded professor was it originally black and white or color? The copy I have now is in color but when I use to watch it as a kid on tv it was black and white.